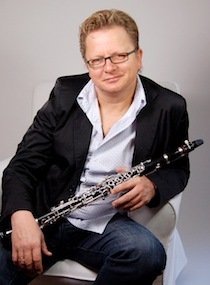 Wenzel Fuchs comes from a region of Austria where traditional wind music is highly valued. The Innsbruck native, scion of a musical family, was already playing the clarinet as a child in various wind ensembles. After first studying in Kitzbühel and Innsbruck, he went to the Vienna Musikhochschule, where he had the opportunity of playing as a substitute with the Wiener Philharmoniker. He began his professional career as principal clarinettist of the Vienna Volksoper, then moving to the Austrian Radio (ORF) Symphony Orchestra and in 1993 to the Berliner Philharmoniker. In addition to his work in the orchestra, Fuchs is active as a soloist and chamber player in, among other groups, the Philharmonic Wind Ensemble, Philharmonic Wind Soloists, Philharmonic Octet and the Philharmonic Friends of Vienna-Berlin. He also teaches in the Berliner Philharmoniker’s Orchestra Academy, holds a professorship at the Hochschule für Musik »Hanns Eisler« Berlin (since October 2008), a visiting professorship at Sakuyou Music University in Okayama, Japan and an honorary professorship at the Shanghai Conservatory, and he gives master classes all over the world. Wenzel Fuchs enjoys skiing and likes most of all to spend his free time with his family.